CD reviews: "The Original Ellington Suite," "We Got it Good And That Ain't Bad" and "Classic Ellington"
These reviews first appeared in the November 26, 2000 edition of the American Reporter. While the late Duke Ellington's centenary birthday was last year, the celebration has continued well into this, with new releases highlighting the work of the legendary jazz composer and band leader. 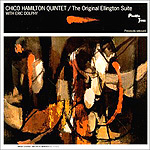 By far the most interesting release related to Ellington from a jazz fan's perspective this last year was the release of a long-lost 1958 session of the Chico Hamilton Quintet. This session, featuring nine Ellington compositions, had never been released  it seems the record company executives were put off by reedman Eric Dolphy's unconventional approach to the Duke's music. A year later, Hamilton put together another lineup (with Buddy Collete and Paul Horn on reeds, replacing Dolphy) and re-recorded his "Ellington Suite"  the version that's been in print all these years. Of course, as the intervening years have brought us not only the free jazz movement, but punk rock and gangsta rap as well, Eric Dolphy's playing seems far less threatening than it apparently did 43 years ago. Instead of coming off as grating or distracting, Dolphy's playing on songs like "In a Sentimental Mood" seems to bring new color and contrasts to Ellington's writing, elements Ellington may not have suspected he included. John Pisano's hollow-body guitar and Nate Gershman's cello provide textural balance to Dolphy's flute, clarinet and alto saxophone. The unusual voicings (how often do you hear clarinet and cello in a jazz recording?) and the leaner sound of a quintet really do quite the nice job of showing off the beauty of Ellington's songs. "Day Dream" gets a smokey patina in this setting, while "I'm Beginning to See the Light" swings more with a slower beat than would seem likely. Given that Ellington himself wrote several compositions in a classical vein (apparently feeling he wouldn't get the respect he craved until he had done so), it's not really surprising that classical musicians would reach out in return. And in Andre Previn, we have one of the few musicians who has successfully navigated both jazz and classical (Wynton Marsalis being the only other who jumps immediately to mind). 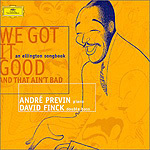 Paired only with bassist David Finck, Previn turns in an interpretation of Ellington that borrows freely and equally from both classical and jazz. While often spirited, Previn's readings of Ellington standards are uniformly thoughtful and introspective. Always respectful of the composition, he nevertheless turns each inside out: interpolating, extrapolating, exploring every possible nook of the melody. The stripped-down instrumentation of a duo also serves the listener well in bringing out new nuances in Ellington's music. "In a Sentimental Mood" with just piano and bass is even more lyrical in this sparse setting. Perhaps ironically, it is the recording done in the format closest to classical music that is most akin to Ellington's own big band recordings. Veteran director Simon Rattle leads the City of Birmingham Symphony Orchestra through a surprisingly raw and vibrant set of Ellington standards, as well as some lesser-known works. That the music was arranged and orchestrated by a jazz veteran, Luther Henderson, only explains part of the success of this project. Having jazz musicians and singers like Lena Horne, Clark Terry, Bobby Watson, Joshua Redman, Regina Carter, Joe Lovano and Geri Allen sit in as soloists can't completely account for this recording's charm, either. The fact is that a bunch of classically trained British musicians learned to swing like hell. And if they don't play exactly like a jazz big band, they come closer than one might expect before listening to this. 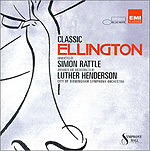 Henderson and Rattle also come close to Ellington's standard at voicing the orchestra. Ellington was famous for writing and arranging his music for the individual performers in his band at any one time. The intricate arrangements here betray an Ellingtonian flair for micro-arranging on Henderson's part, and on Rattle's at bringing it all out in the performance.